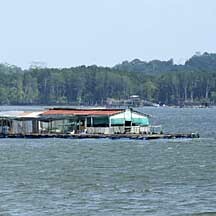 Commercial fish farms can impact the surrounding habitats. Find out where your fishes come from. Eat less fish, don't throw fishes away. Reduce costs of searching, catching and transporting fish. Stable and predictable supply of fish. Not necessarily achieved as mass deaths of stock can occur. Reduce overharvesting of wild fishes. Not necessarily achieved as wild fishes are still caught, to feed the farm fishes. Parasites and diseases from farmed fish can spread to wild marine life. Drugs, including antibiotics, given to farmed fish to keep them healthy. Excess and uneaten food given to farmed fish. Non-native farm fishes which escape can threaten native wild fish. Farmed fish are fed pellets made from other fish, depleting other fish species on a global scale. Often the small fishes which are daily staples of poor people are used as feed for larger farmed fishes which are sold as luxury items. 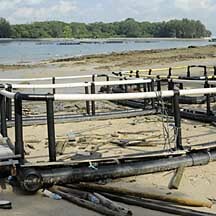 Setting up and running fish farms can physically impact the surrounding habitat. No door-to-door trash collection is provided to any of the coastal fish farms licenced by Agri-food and Veterinary Authority (AVA). 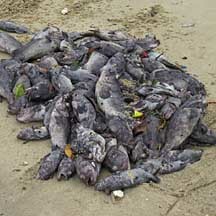 As a result dead fishes and other trash are dumped into the water. More details here. What are some features of sustainable acquaculture? "Ecologically integrated into the agricultural, industrial, and community fabric, meaning, for example, that wastes become fertilizers rather than pollutants. Additionally, these species are herbivores, so other fish species are not used in their production" From Aquaculture on the David Suzuki Foundation website. Find out where your fish comes from. Tell your supplier and supermarket you prefer fish from sustainable sources. Eat what you take. Don't throw away fishes! (or any food for that matter). Many marine animals have died and people have suffered to put that fish on your plate! See also impact of prawn farming. Fish farm off Lazarus and St. John's Island. 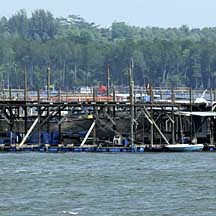 Fish farm off waters of Pasir Ris and Pulau Ubin. Foodfish farming in Singapore on the AVA website: one paragraph description. Aquaculture on the David Suzuki Foundation website. 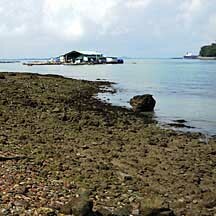 Some thoughts on the fish kill at Pasir Ris on the Water Quality in Singapore blog. Aquaculture: where does the fish poop go? What goes on at Singapore's largest commercial fish farm? Boosting fish farming in Singapore: what environmental impact? Coastal fish farms: where does the fish waste go? Why are there so many dead fish at Pasir Ris?